I have tried to send the membership fee from my state (Tamil Nadu) due to the election deceleration and Pan card issues, I couldn’t transfer money from my account. So, I requested Sensei Siba Sankar Das’s help and he agreed to transfer the amount from his account. We have sent money to his account on 10/03/2016. According to Sense Das, his bank’s internal server has some problems which makes a delay in transferring the money. He has informed us and had told that he even conveyed the issue to Japan. We had planned to organize a South India Championship on 27th March 2016. We had discussed with Sensei Das about it and he had given his complete support for the same.So, We have successfully completed the Championship. Sir, We request your guidance and suggestions always as we wish to grow more in so-kyokushin. Please forgive us if we have made any mistakes. Sir, I want to participate in the World Tournament. I wish to know the procedure to apply for the World Tournament. 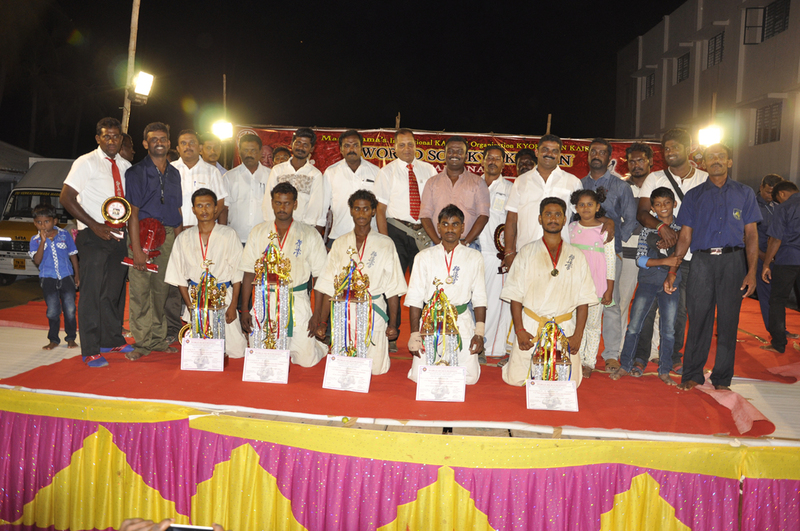 Sir, I attach the photos of our So-Kyokushin Full Contact Open South India Championship. Please have a look onto the photos. We had organized a So-Kyokushin South India Full contact Open Karate Championship on March 27, 2016, Open Category. We have successfully completed the tournament. There were 32 (Thirty Two) participants from three states, including, Kerala, Tamil Nadu and Andhra Pradesh. The last date of Application was 15th of March. And the Registration was on 26th March till 5:00 PM. We provided the breakfast for the participants at 7:30 AM. The medical checkup was at 9:00 AM. The participants were given their lunch by 12:30 PM. The Championship was inaugurated by the Local Legislative Member at 5:30 PM of 27th March 2016. The Championship concluded at 9:30 PM of the same day. Winner of the So-Kyokushin South India Full contact Open Karate Championship was Mr. Vadivel 4th Kyu from Tamil Nadu. And the Best fighter was Mr. Siripi Venkatesh 7th Kyu from Andhra Pradesh. The judgement was truthful and honest. We provided the food and accommodation for the participants from 26th March to 28th March. The participants checked out 28th March morning 9’o clock.